The cream colored channel protector that comes on the scoot, partially slid out. If you look closely, you can see the small holes where the cotter pins go. I save this protector and put it back in when I fly, to protect the channel. Place the back panel of the wire basket in the channel and center it. At this point, it is easier to velcro the back panel of the basket to the steering column before inserting the cotter pins. to remove the cotter pins when taking the basket off. My red nylon cord with cord lock. The little red bungie goes diagnally across the underneath the bottom wire, one hook in one side panel and the other hook in the non-opposite side panel on the other side. My work laptop in the basket. The wire basket carries about 20 pounds and does not interfere with steering as a heavily loaded handlebar basket might. If you remove the bungie, and fold up the bottom, the basket also folds flat without removing the basket. However, I usually remove it and reinstall it about once a week since it fits in the backseat of my friends sedan better without the basket and without the back rest. One of my friends drives me to church on Sunday and this is how we secure my TravelScoot in the back seat of her sedan. The peg board just keeps the scoot battery from hanging on the edge of the seat. She holds it snug by bungie cords hooked to some baby seat securing devices. I think you will enjoy this story. Today, after a meeting at school, I was flying down the hallway, on Silver, heading to my class. I go fast when there is no one in the hall. I have a new class this year but my former students are still very close to me. This is a class with developmental disabilities. Well I could hear them when I passed their room, "What was that! Man she going too fast. etc." Before I had a chance to call their room two of the students came in with a ticket for me. It read, "Speeding in the hallway. Court Date 8/30/2010 9:50 am. Guilty. Fine 2 bags of microwave popcorn." The Scoot has a serious talk with her young cousin at a bay harbor south of Melbourne. This photo was taken at the 2010 NAAFA Convention in San Francisco. From left to right it's Carole, me, and Lynn Ellen. Carole's a brand new TravelScooter and Lynn Ellen's been navigating San Francisco (and the world) in hers for almost as long as I've had mine. I started this blog because I had something to say. What I didn't realize at the time is that so many of you had something to say too. In my 18 months of building this TravelScoot community, I have met interesting, resourceful, and motivated people. We share not only a bond of mobility challenges, but a problem-solving outlook on life. We use our TravelScoots as a tool to aid mobility. Mine has become an extension of my body. This week I met Katy, a new TravelScoot owner. When she rode her TravelScoot for the first time, with her granddaughter running alongside her, laughing, she felt like she was reliving her 8th birthday, cruising the street on her new pink bicycle, a 26" Rollfast. Katy gave me permission to share her story with you all. Enjoy! First of all, thank you, thank you for this blog! It's simply wonderful to read about everybody's adventures. Some background... I have a form of muscular dystrophy that has resulted in significant weakness in many muscle groups in my body, especially my hips and thigh muscles. I wasn't diagnosed until 2002 (at age 47), and was prescribed high doses of prednisone, which turned out to be exactly the wrong thing to take. After gaining about 80 lbs., I also developed steroid myopathy; I believe this was the main cause of the leg weakness, as the form of MD that I have is supposed to primarily affect the face, shoulders and upper arms. Anyway, between the MD and the side effects, I asked my employer for an accommodation under the ADA to work mostly from home. I've gone into the office periodically to do those tasks that I can't perform at home. I bought a rolling walker for support and to help me deliver heavy loads of manuscript to various departments. Eventually, I had to sling a toilet riser underneath (bless those bungee nets!) as it was becoming increasingly difficult to get up from the standard height toilets. 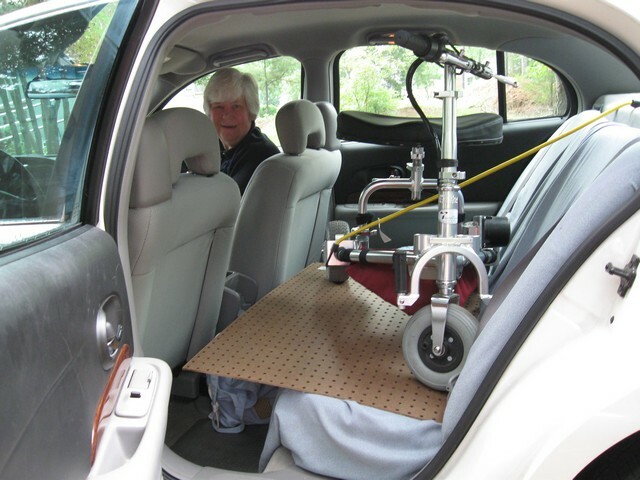 As the years have passed, I've had to raise my sofa six inches, bought a uplift cushion to get out of my kitchen chair, and bought a minivan, not only for the higher seat, but to haul the walker without having to fold it up. This year, getting into the building at work and walking the long hallways, even with the walker, has become increasingly slow and painful. Lifting the walker into the car (behind the front seat through the side door) has also become nearly impossible. And then my employer decided to tighten up the work-at-home policy. Technically, I am still covered under the ADA accommodation, but our work is becoming more collaborative and it has been communicated that we won't be able to work quite so independently in the future. I can't afford to be left in the dust. Furthermore, I haven't been in a grocery store since last winter because I can't use the store-provided electric carts. The seats are too low. If I have to bring in a cushion, how do I get it into the store? I have a hard time raising my arms up higher than shoulder level, so getting things from the higher shelves is a problem. I used to be able to pile over $100 worth of groceries on my rolling walker, but that has become difficult, too. Enter TravelScoot! After looking at various mobility chairs and scooters, I believe I have found the best option for most situations. I seriously considered getting a mobility chair to leave at the office, but then getting in and out of the building would still have been an issue. I've often joked that I needed a burro to haul everything--the toilet seat, the laptop bag, the booster cushions, the half-step cane, etc. I expect that my TravelScoot will be my beast of burden. My employer has agreed to get me a higher work chair, loosen up the tension on the restroom doors (was trapped in one last year until the cleaning crew came along! ), and to provide toilet risers in a few bathrooms around the building, but I'll still need to carry a lot of stuff whenever I go out. Today, for the first time in a few years, I rode around the block! My 19-year-old granddaughter ran next me, laughing, shouting to me, "Are you having fun??" I was having a blast, although I'm also mindful that if I fall off or tip over, it'll take two men to get me on my feet and it won't be pretty. I'm still working out the best way to get it in and out of the car. I can't lift it completely assembled, and the pulley idea I had (which I posted before under Anonymous) isn't working out as I'd hoped. I did have some luck testing out some shelving boards (3 or 4 ft. long) as a mini-ramp, using the throttle to have the TS go up under its own power (I turned the tiller around so the throttle was on the left since I stand near the driver's door for balance). I can disassemble it if I have to, though, and I might have to do that for now as I'm supposed to be at work on Monday (thankfully only 2 days/week for now). To get on the TS, I have to sit on the seat sideways and rotate. It's a bit difficult to get my leg through, but I am a Gumby. To get up, I have to swivel again to the side and put my hands on my knees with my elbows locked and push up. I'm having no luck getting the brakes to lock (granddaughter does it with no problem), but I'll probably have the TS against a wall or some file cabinets if I feel unstable. I put a headlight and tail light on TS because I know I'll have to leave work in the dark. I bought the cup/bottle holder, too, and the velcro hooks. The toilet seat is resting comfortably on the bottom frame. Now I have to think of a great name for my new friend! Last night at Target we were waiting in line to check out and there was a little girl who kept checking me out. 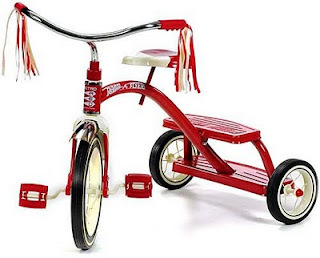 Then out of the blue she declared, "MiMi, that pretty lady has a tricycle almost like mine." Of course the grandmother quickly told her that it wasn't polite to talk about people but this child was determined. After a couple of minutes she couldn't stand the silence and came close to me so she could tell me all about how we have tricycles that are alike. Boy was she excited when I rang the bell and she had one like it. When her MiMi called her to go, she said that she wished I would come to her MiMi's house and ride with her. 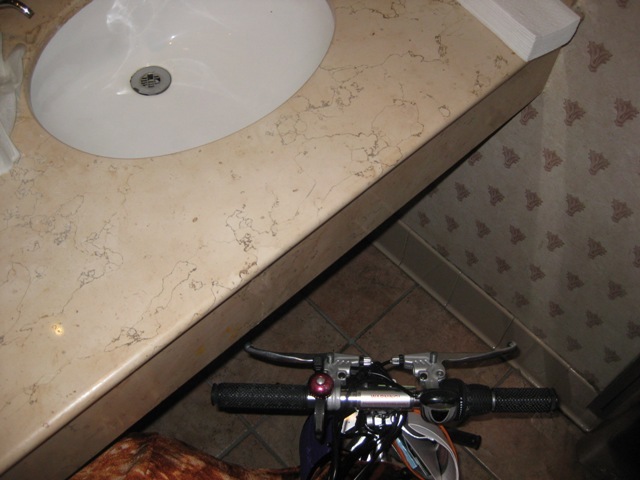 When I take my TravelScoot into a public bathroom sometimes the handlebars keep me from getting close enough to the sink to wash my hands. That's what you see in the first picture. My easy solution is to drop the handlebars down. It only takes a second, and then I can get close enough to use the sink. This also works if you need to pull up closer to a table. There's just one clamp that you open and the handlebars drop down easily. 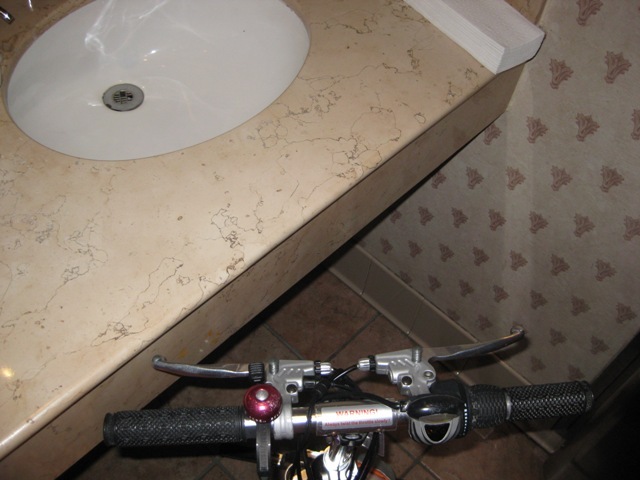 This is a picture of my TravelScoot at a restaurant. I wanted to show how easy it is to store it at the table and keep it out of the way of people walking by if you just move one chair. Arrive in Newark and go to hotel pickup zone. 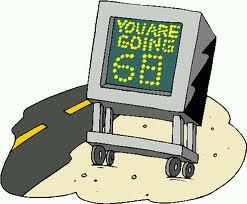 Driver arrives and announces handicap pickup system is broke. My response is with one hand I hand him my noble steed and he puts its front tire over the lip of the luggage rack. It again saves my trip. Off to bed at my hotel. 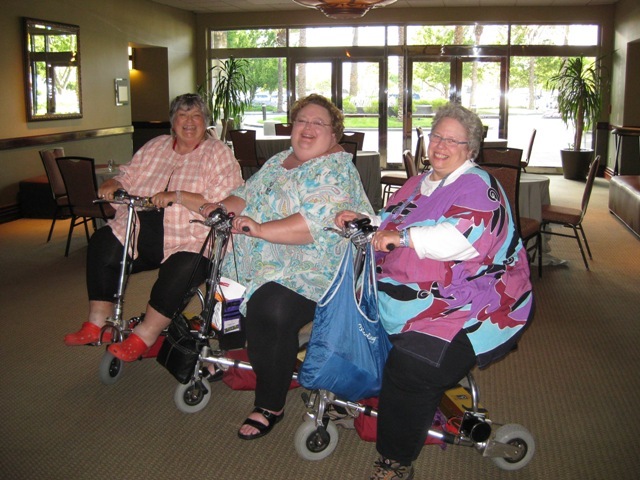 Before I had my TravelScoot I used to use the store scooters at Walmart and Target. That is, when they were working and available. Walmart is pretty good about keeping their scooters charged and Target is especially horrible at maintaining theirs. I understand they provide them as a courtesy to their customers, but if they're going to give more than just the appearance of providing them, they should actually work. On Friday I was at Target and saw the abandoned (unworking) cart in the picture above. I was at the other Baton Rouge Target today and saw where the only scooter available wasn't working. Alan and I were eating lunch, so I got to watch as a potential customer would sit on the scooter and try to start it up, then end up either abandoning it or going and getting a store employee to assist them. The scooter wasn't even plugged in to recharge the battery, if that's what was wrong. On our way out of the store I saw a woman with a cast and crutches make her way to the scooter only to realize minutes later that it didn't work. The number of carts we have at each store is based on guest demand, and the carts are available on a first-come, first-served basis. I'm sorry that there weren't enough functioning carts available for use during your visit to our Baton Rouge Target store. More Adventures of the Little TravelScoot that could! We just returned Saturday from our latest trip. This time we booked a river cruise and Passion Play on Viking River Cruises. We tried to book on Uniworld, but they do not take scooters! We started in Munich, we went to the Linderhof castle. The bus drivers were fascinated with this little scoot. Starting at the bottom of a 500 foot scooter climb! Don’t try this one in a stock scooter. Looking down from the Castle! I searched a light scooter on internet and found Travelscoot, which I can have in my car Audi A6 without problems. I have not seen any in SWEDEN, many persons ask me about it. I also have a miniscooter (80kg) 176 pound. Its too heavy to get in my car. I and my family my wife chidren and grandchildren are going to Mallorca next week. I have talken to Thomas Cook Airlines and it would be no problem with Travelscoot. I like Travelscoot, I can go with my family almost everywhere. Thanks again for what you have done to help so many people!!!!! Here we have another episode of Alan and Dave doing scooter maintenance, this time with Mark's help. Rhonda was having a problem with her scoot where she had to jiggle the power switch to get it to come on. Alan and Dave decided to take a look at it and see if it was something they could fix, or if a part needed to be replaced. These are my notes. If I've used the wrong words or am not explaining it clearly, I hope someone with more experience will add clarifying comments. There are 3 screws that hold the cover on the throttle board. The cover is where you see the green, yellow, or red battery lights. First, they used an Allen wrench with a hex key head to loosen the screws on the hand brakes to rotate them out of the way so they could get access to the Phillip’s head screws on the underside of the control box. This allows the cover to be removed. The on/off switch is soldered onto wires coming from the control board. Alan sprayed LPS Contact Cleaner on the switch, and then worked it back and forth for it to dry. After that he sprayed LPS2 Lubricant on it and worked it back and forth again. They reassembled everything and it's been working perfectly for almost 2 weeks. The pictures tell the story of what happens when you drop a small screw on a wood floor. First you get the two adult men looking for it, and when they can't find it you call in Mark, who is eleven and very helpful. Melissa, Greg, Alan and I flew with two TravelScoots on Continental from New Orleans to San Francisco, changing planes in Houston. On each leg of the trip we followed the same procedure. We checked our baggage either at the curb or at the counter inside, then proceeded through security on the TravelScoots. Once we got to the metal detector we each got off and walked through. This makes it easier for them to check us AND the TravelScoot. They pull it through a different gate and swab it, then give it back. Melissa was traveling with one regular lithium ion battery and I was traveling with two regular lithium ion batteries. After security we made our way to our gate, and stopped at the counter there to ask for gate check tags. The pictures above are of these tags. (We actually ended up moving our tags so they were attached much lower on the scoot.) When we got the gate check tags we also asked to pre-board, which we were able to do for all four flights. Our husbands pre-boarded with us. We drove our scoots to the door of the plane then detached the handlebars, dropped the handlebars down, and covered them with a protective bag. I used the TravelScoot travel bag. Melissa and I both chose to take the lithium ion batteries on the plane with us. You could also leave the batteries with your scoot, but we both felt more comfortable keeping them with us. This keeps any airline employee from riding the scoot and protects the battery from mishandling. Hardy Huber has written more detailed instructions which are at http://mytravelscoot.blogspot.com/2009/05/new-and-easier-way-of-airline-travel.html. Three of the times we exited the plane our scoots were waiting at the door. On our very last flight we had to wait a few minutes for them. We reassembled them there and rode them into the airport. The Continental staff was professional, friendly and helpful. We had no problems on any of our flights. I've been away on vacation in San Francisco for a week and I have lots of TravelScoot pictures to share with you. This first picture was taken on our way to the airport. 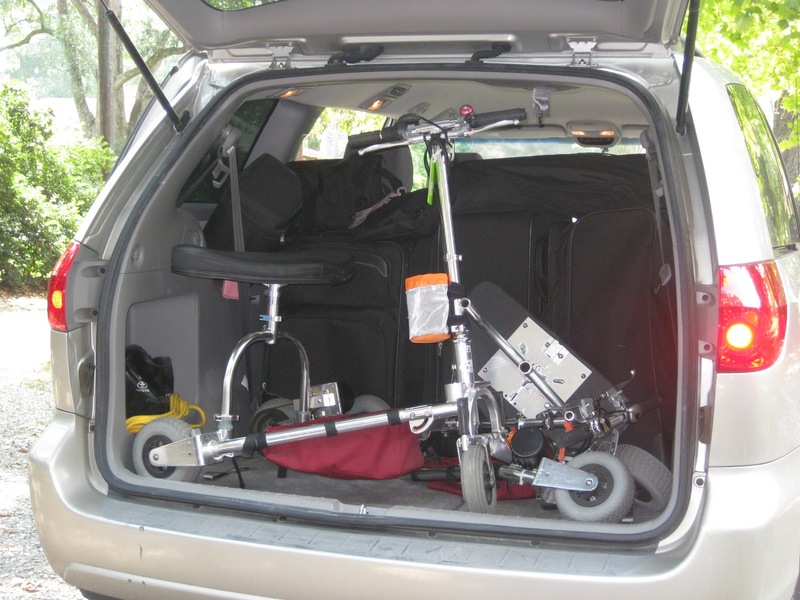 There are 4 large suitcases, several smaller pieces, and TWO TravelScoots in the back of this Toyota Sienna minivan. It was a great fit, although we did collapse one scoot to make them fit better.